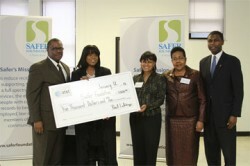 Safer Foundation was honored with a $5,000 ‘Investing in Illinois’ Award from AT&T Illinois for its commitment to reducing recidivism and incarceration rates across the state. The AT&T Investing in Illinois Award provides resources and recognition to organizations that work to improve their communities and the state by advancing education, economic growth, new technologies and other essential community services. Chicago-based Safer Foundation was founded in 1972 to provide employment, educational and supportive services to individuals with criminal records. With its focused approach to providing employment assistance to formerly incarcerated individuals, Safer Foundation has a long history of helping reduce recidivism in Illinois. For more information on Safer Foundation and the results of its work in reducing recidivism rates and prison costs in Illinois, please visit www.saferfoundation.org.